If there is one accessory that you can never have enough of, it is the scarf. Adding a scarf to an outfit instantly takes you from simple to sophisticated. Scarves are practical for keeping you warm in the winter, but also add a trendy touch to a fall, spring, or summer outfit. Buying new scarves is fun, but making your own scarves is even better. Instead of spending a fortune on a generic accessory that looks just like any other, you can create a custom, beautiful scarf that is just what you always wanted. If you aren’t an experienced sewist, have limited time, or don’t sew at all, you may be intimidated by the thought of making your own scarf. However, you don’t have to be the best sewist to make your own scarf. In fact, you don’t have to sew at all. We here at Seams and Scissors have compiled this collection of 6 Simply Stylish No Sew Scarves. With these fun, easy no sew projects, you can learn how to make a scarf without ever picking up a needle and thread. You can create a gorgeous scarf from repurposed clothing, like this DIY Multi-Strand Scarf. For an easy look that will effortlessly bring a trendy flair to your wardrobe, we’d recommend this Country Chic Blanket Scarf. These DIY scarves make great homemade gift ideas for family and friends, who will be so impressed by your crafty skills. Check out these quick, incredibly easy no sew scarves and prepare to be amazed. Fleece and Fringe Scarf: Easily create a funky, eye-catching DIY scarf that would create a casual but fun look when paired with a basic tee and jeans. How to Turn a Regular Scarf into an Infinity Scarf: If you want to join in on the infinity scarf craze, but feel too guilty about buying one when you already have a million regular scarves in your closet, this tutorial from Two Twenty One is for you. In just moments, you can change a traditional scarf into a trendy new accessory without spending a dime. DIY Multi-Strand Scarf: Upcycle your unworn clothing into a fashionable, unique scarf with this easy tutorial. This skinny scarf from Rabbit Food For My Bunny Teeth would look beautiful paired a chunky necklace and a simple blouse. DIY Braided Cowl Neck Scarf: Cowl neck scarves are great for keeping you warm while also adding sophistication to your wardrobe. 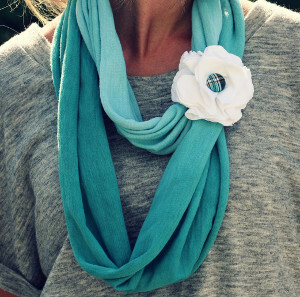 This cute braided scarf from La Vie DIY is so simple that you’ll want to make one in every color. Ombré Infinity Scarf: Two of the hottest fashion trends right now are ombré and infinity scarves. Combine the two with this gorgeous DIY no sew scarf from A Bit of Sunshine. Complete your pretty look with a fabric flower that adds extra detail. What is your favorite way to wear a scarf?